Photos Of Gaza War From International Space Station. This is the photo taken from the International Space Station that has been called the “saddest photo yet”. Astronauts aboard the International Space Station have shared some incredible photos with TwitterVerse, but this one has left some people speechless. This image was captured above the Middle East by the German born astronaut Alexander Gerst. 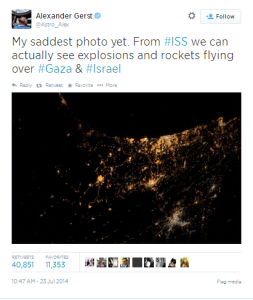 He explained that this photo he took shows explosions and rocket fire over Gaza and Israel where there has been much bloody conflict between Israel and Palestine militants. The landmass in the photo appears to show a sideways view of Israel. 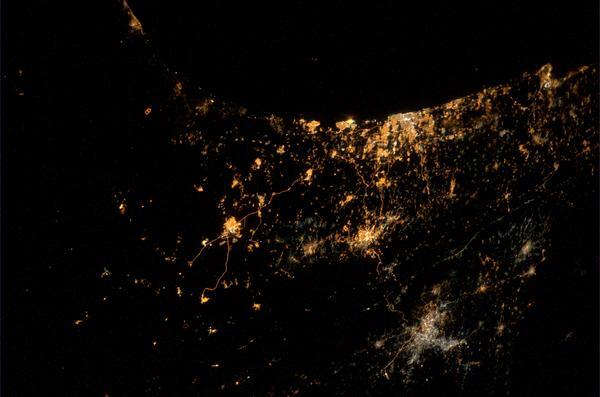 Vox.com reported, north is to the right in the photo and South is to the left; so the dark area at the top is the Mediterranean Sea and the brightest spot on the coast is Tel Aviv. Conflict has continued to escalate this month after Israel launched a ground offensive attack to curb rocket fire from Hamas and its allies. The death toll hit 687 this week, which included many civilians and children.